Gmail is a simple way to help organized your email. Here are a few simple reasons that Gmail makes my life and review blogging easier. 1. Each time someone enters a giveaway, I get a new email into my inbox. Gmail bulks all these emails together so I get one email for each giveaway up until I receive 61 comments. Some giveaways have had over 5000 entires, this would mean over 5000 emails for one giveaway alone, thanks to Gmail, it is broken down into just over 80 emails. 2. I also use the coloured stars and check marks to organize my reviews. I use the red explanation mark for a sponsor that is going to send a product for review, and a green check mark when it comes in the mail. This way, I can follow up with the sponsor to let them know the product was received, or ask the sponsor to check on shipping. Â I can also filter through all my emails to just show those that are starred. All it takes to make these emails “special” is a simple click on the little white star. It’s easy and very effective. 3. You can also organize your email by folders. For example, I could put all my winners into one folder and then verify with my spreadsheet to make sure they have all contacted me so there is no need for a redraw. Or, I could put all my comments in a comments folder so my inbox isn’t overflowing with comments. I could also put all the review requests into a review folder. There are really unlimited possibilities when it comes to folders, you can be as detailed and organized as you like. 4. Another feature that I like with Gmail is Tasks. Many times I get emails from people that I am unable to complete at the time, such as picking out a product for review. I will put that item in my task list to be completed later and then can cross it off when it’s complete. It has made things way easier for me. I hate having to remember things in my brain – because they often get forgotten. With the tasks option, I never forget. I also use the tasks option if I have asked someone to do something for me and may be waiting for a reply. 5. I also like the possibility of adding other email addresses to your Gmail account. 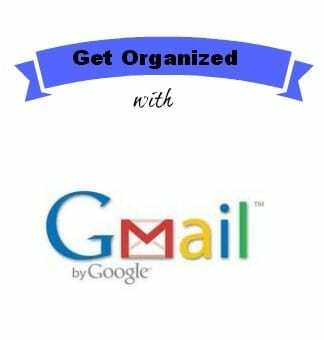 If you have more than 1 email address, you can addthem to your Gmail account and all your email can be read and replied to in one spot. You can also choose which email address you want your message to be sent from with the drop down menu. This is truly a simple feature that has made emailing much more enjoyable. I remember at one time in my life I had a number of different email addresses, for school, personal use and then just a few junk email accounts. Now, I can have all those emails in one spot and only need to check one email address to get all my messages. 6. Gmail chat is also an excellent tool. I have used the chat feature to talk with sponsors if I have a quick question, it’s easier than sending out an email and I can always see who is online. I am sure that Gmail has many more features that I have yet to learn, but for the most part, these are thing simple things that have helped to keep me organized with emails – because we all know, there can be a lot of messages coming in everyday and I don’t want to miss anything important. The following is a guest post from Lynette at My Wee View. I’m a new Monday Follower! Your site is so cute! To find some great deals and Freebies visit me at http://www.rockindeals4you.com/?p=4792 and sign up for my newest giveaways!